Border Forces foiled an average of 153 attempts by migrants trying to get to the UK from France every day last year. More than 56,000 attempts were made by people trying to get into Kent from French ports and terminals in 2016. The government figures, released under freedom of information, are the second highest in seven years, despite dropping by 25,000 compared to 2015. The Home Office said the decrease was a "success". Dover and Deal MP Charlie Elphicke said it was "shocking". 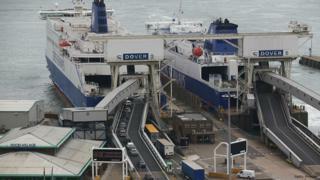 The statistics include people stowing away in vehicles at Calais and Dunkirk ports as well as Eurotunnel and Eurostar terminals. They also showed the number of illegal immigrants who were found in UK ferry ports increased last year. There were 1,868 detected in 2016, compared with 1,305 in 2015. Mr Elphicke said: "It's shocking that migrants at Calais tried to break into Britain more than 50,000 times last year. "These figures underline the true scale of the challenge we face - and why we need more investment at our border. "This is why we worked so hard to get the Calais Jungle dismantled." The Jungle was home to about 7,000 residents living in squalid conditions and became a key symbol of Europe's migration crisis. It was torn down in October and migrants were bussed to reception centres across France to apply for asylum. The government worked with French authorities to disassemble the camp and has built a wall along the main road into Calais to prevent stowaways jumping into lorries. Global border security consultant Tony Smith, former head of the UK Border Force, said massive investment in border controls in the past year had contributed to the drop in figures. He said: "The 56,000 [figure] is a direct reflection of the fact that we are now [working] with the French to conduct much more thorough checks, but also of the infrastructure, the fencing, and CCTV which have all been invested in. "There was a huge community of migrants, smugglers and traffickers around Calais, but this new infrastructure, coupled with the work by the French to dismantle the camps, has had an impact." The Home Office said the number of attempts included instances where the same migrants had repeatedly tried to gain entry on different days. A spokesperson added: "These figures make absolutely clear that our approach to securing the UK's border is working. "Despite our successes in preventing attempts to enter the UK illegally, we are not complacent. "We will continue to work closely with our French counterparts to maintain border security and keep legitimate passengers and trade moving." The Road Haulage Association said violence at French points of entry has increased in recent weeks and drivers were refusing to make the trip. Spokesman Rod McKenzie said: "Our members are terrified and angry. Gangs of marauding migrants, often armed with iron bars are attacking their vehicles. "The police are heavily outnumbered and it's clear that they can no longer cope with the ever increasing numbers trying to make the crossing to the UK. "We hear of drivers refusing to make the journey between Dover and Calais while many hauliers are rerouting their vehicles around the Port at a cost of many thousands of pounds." How do you solve a problem like Operation Stack?